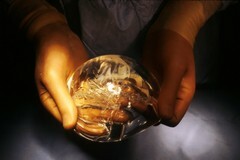 Hand holding a breast implant which is a flexible sac filled with silicone gel. A surgeon inserts the sac into the chest just under the skin. This implant can be inflated with air or injected with a saline solution to adjust the size.